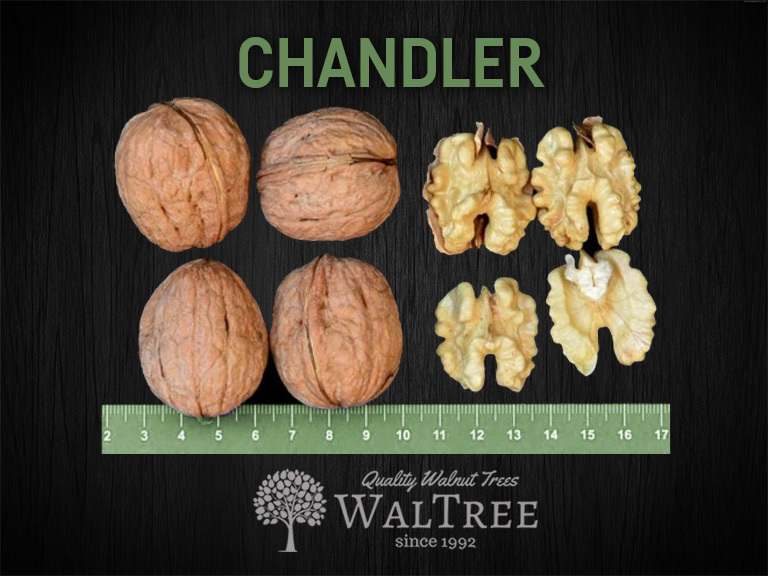 Chandler is our top selling walnut tree variety. It was developed by University of California. 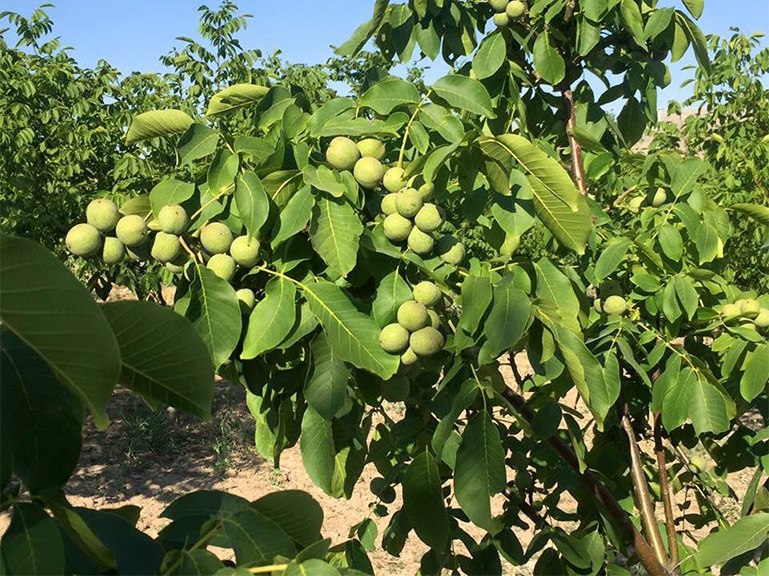 In the recent years, Chandler is the most preferred walnut variety for new orchards because of its productivity and excellent nut quality. Yield: Chandler is a highly productive variety. It is a lateral bearer with 90 percent of its lateral branches being productive. Therefore it offers very high yields. You can start collecting fruits as soon as 3 years after you plant your trees. Check the productivity table under this page to see productivity over years. Nut and shell quality: Chandler produces large nuts with thin shell and very light-colored kernels. Thin shell and kernel color are important features in determining walnut selling price. Walnuts that have lighter kernel color sell for higher prices. Its kernels are easy to remove from the shell and easy to crack out into halves. Tree size: Chandler grows in a moderately vigorous way and it is semi upright. Chandler is suitable for high density planting such as 6 x 5 meters spacing. More details about tree spacing are provided down this page. Leafing time: Chandler is a late leafing and blooming variety. This is an advantage, because late leafing varieties are less likely to be affected by frost, walnut blight and codling moth. Pollination: Chandler is a self pollinating tree, it can yield walnuts without a pollenizer. But it can give you higher yields when used with a pollenizer. Franquette is used as pollenizer with Chandler trees. Rootstock: At Waltree we bud Chandler onto Juglans regia rootstock (known as English walnut). It is a commonly preferred rootstock because of its tolerance to blackline disease. Chilling requirement: Chandler requires about 700 to 1000 hours below 7°C. 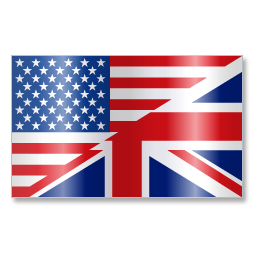 As Waltree we can look at the weather information of your country and city, and we can tell you whether your location is suitable to grow Chandler. What does chilling requirement mean? When to plant: Chandler can be planted from November until April of next year, depending on your country. Please ask us if you are not sure. Chilling requirement is the minimum amount of hours a tree needs to spend in cold weather in order to give fruits in the harvest season. Chilling temperatures for walnut trees are 0°C to 7 °C. Please enter the area of your land below to calculate number of trees you can plant. Chandler starts producing walnuts very early. Your trees will be 2 years old when you receive them. Begin giving fruits even in their first year after planting. However, in order to conserve the energy of the tree and improve the productivity for the following years, we recommend you to cut down the fruits for the first 3 years. After 3 years you can start collecting the fruits and your orchard will start producing walnuts that you can sell. You can check the Chandler walnut tree yield table to see how many kilograms of walnuts you can collect per tree. The numbers expressed as yield in the table are dry walnuts in kilograms. We deliver our trees to our customers location starting from November until April next year. Do you need the trees delivered to your country? We can arrange a transportation company to deliver the trees to your location. Please ask us the transportation cost to your country. 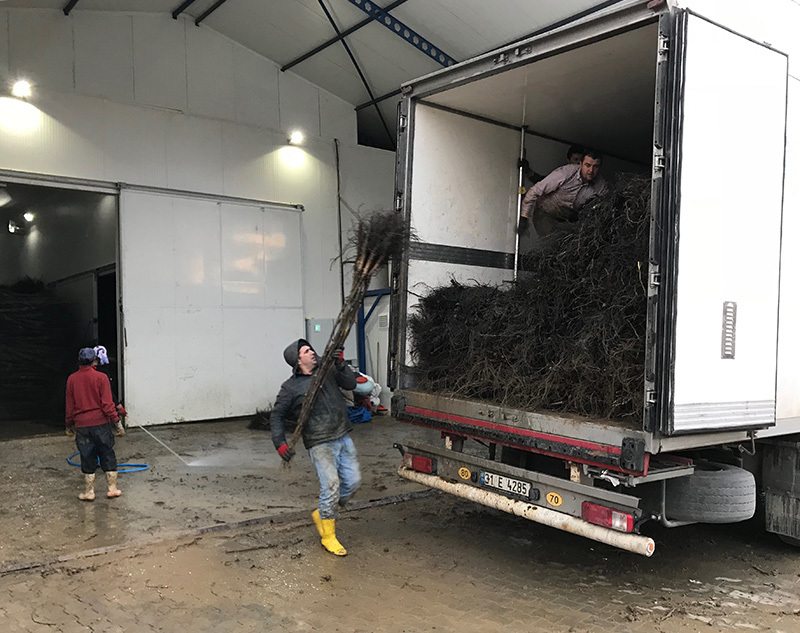 We wash the the roots of trees before loading to the truck and clear them of any soil. We send the young walnut trees bare rooted and dormant(in winter sleep). We have phytosanitary certificates for all of our tree varieties. Our nursery prepares every necessary document needed to export the trees. All you have to do is be ready to receive the trees in your location. You can plant the trees within a week of delivery or store them until you are ready to plant them: read the instructions below to learn how to store your trees. Not ready to plant your trees? You can store the trees until you are ready to plant them. Choose a location that doesn't take much wind, it can be inside or outdoors. It is important that you store them somewhere preferably between 0 and 8 degrees celcius so that trees don't wake up from their winter sleep. Bury the roots of the trees in sand or soil and keep them like that until you plant them. We offer free guidance and consultancy to our customers after their purchase. Every country have different soil and climate therefore they have different needs. Depending on your land's location, we give you detailed instructions on how to grow your trees. 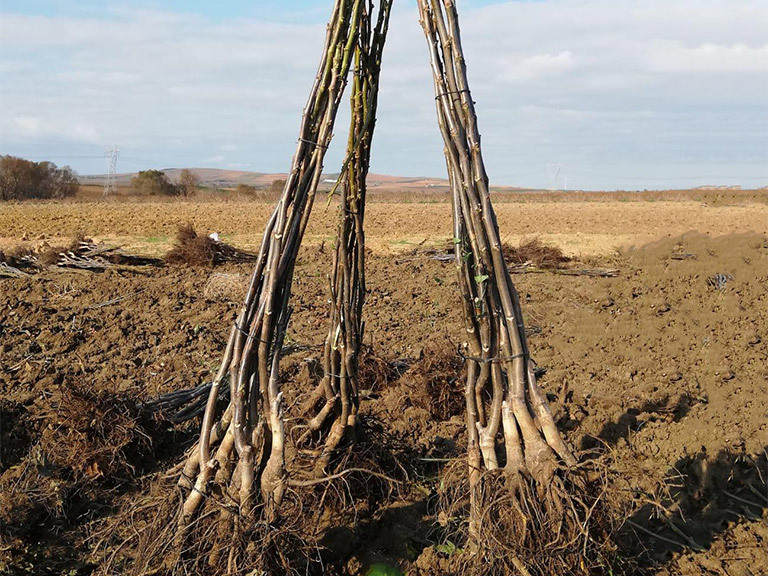 We help you on the subjects: how to prepare your land for planting, which fertilizer to use, how to prune your trees and how to manage your orchard through years. Which walnut tree variety is best for my land? This depends on which country and city your land is located. Please contact us and we can research various features of your land including its altitude, year round temperatures, humidity, soil type and other factors. Depending on these information we can tell you which variety would be the best for your land. What size trees should I buy, what is the difference? Bigger trees are a bit more expensive than the shorter trees. But bigger trees start producing walnuts sooner than the shorter ones. Therefore, the decision is up to you. 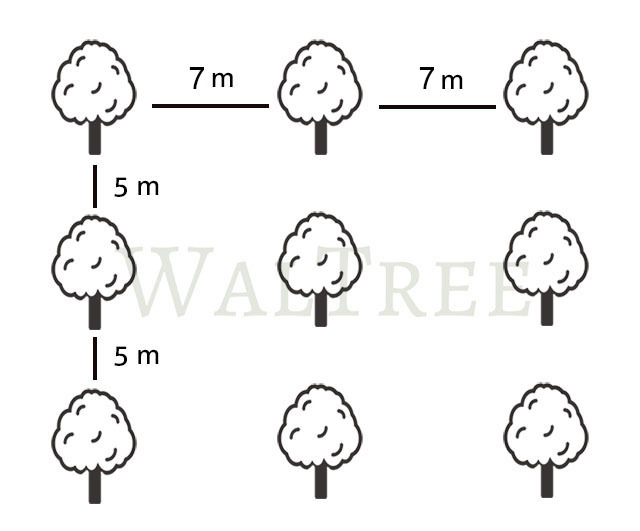 We sell our trees in 3 sizes: 50 - 80 cm; 80 - 120 cm; and 120 - 150 cm. Please visit our prices page to learn our tree prices. 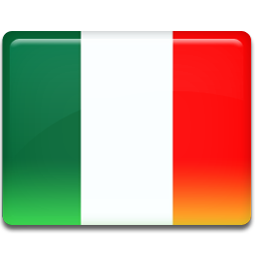 Do you have phytosanitary certificates? Yes we have phytosanitary certificates for all of our walnut tree varieties. Our certificates are issued by Turkish Ministry of Agriculture. 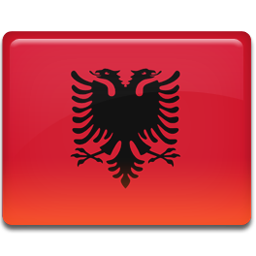 Do you export to my country? We export our trees to pretty much every country in Europe and Asia. 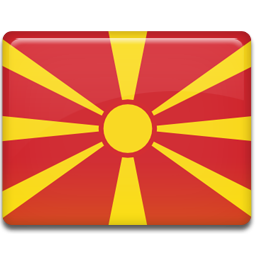 In the recent years we have exported to Greece, Bulgaria, Macedonia, Romania, Kosovo, Italy, Spain, Uzbekistan, Turkmenistan, Azerbaijan and more. Can you transport the plants to my city? Yes, some of our customers want their trees to be shipped to their city. If you prefer, we can arrange a truck to deliver the trees to your location in a refrigerated container. Otherwise, you can arrange a transportation company yourself and we can load the trees to the company’s truck. Also, as a third option you can come with your vehicle and pick up your trees from our nursery. Is the transportation cost included in tree prices? 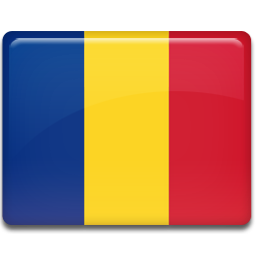 Our prices include tree price and everything else including document fees to export the trees to your country. However, our prices don’t include the transportation fee. If you want your trees to be delivered to your location, please ask us about the transportation cost. What should be the distance between the trees when planting them to our land? Our suggestion is for you to plant them with 6 x 5 meters of distance between the trees. When will my trees start producing walnuts? Your trees will be 2 years old when you receive them. You can start collecting their walnuts 4 years after you plant them. How should we prepare our land for planting the trees and what is the procedure for planting? When you buy your trees we give you free consultation and advice on everything you need to know from start to finish. We also check your soil analysis reports and give you suggestions based on your report. Fill out a quick form and we can send you a price list in 24 hours. Copyright © 2019 Walnut Tree Nursery / All rights reserved.